Shop by Categories – Ceiling Lights – Ceiling Pendant Lights Single Glass Pendants Wire & Fretwork Pendants Drum & Fabric Shades Iconic Pendants Metal Pendant Lights Offset Pendants Bare Lamp Pendant Lights Plaster & Ceramic Pendant Lights Rise & Fall Pendants Scandinavian Pendants Vintage Style Lighting Clustered Light Pendants – Multiples – Suspended Ceiling Lights Suspension Lights Light Fixtures – Long Drop Bar Suspension Lights – Spotlights & Spotbars Light Bars 2 – 4 lamps Single Spot Fixtures Light Bars 5 – 8 lamps Surface Mounted Spots Round Spot Plates Square Spot Plates – Chandelier Style Lighting Art Deco Chandeliers Chandeliers – Bronze and Brass Chandeliers – Ironwork Modern – Glass Shades Chandeliers – Ornate Flemish Chandeliers Contemporary – Bare Lamps Modern – Cloth Shades Modern Crystal Chandeliers Traditional Crystal Chandeliers Ultra Modern Chandeliers – Flush & Semi Flush Light Fittings Ceiling Fixed Drum Shade Fixtures Flush Fittings In A Modern Design Basic Flush Light Fixtures Traditional Flush Fitting Modern Semi-Flush Lights Ornate Semi-Flush Lights Traditional Semi-Flush Lights Smaller Flush Fitted Lighting Interior Hanging Lanterns Dining Room Ceiling Lights Hand Built Artisan Lighting LED Ceiling Lights Cornice LED Lighting Systems Fun & Funky Ceiling Lights Rise & Fall Pendants Shades (Non Electric) Ceiling Lighting – Kids Ceiling Lights That Save Energy Designer Ceiling Lighting Double Insulated – Wall Lights – Bedside & Reading Lights Bedside Reading Lights Fixtures with Reading Lights Bedside Lights – Switched Bedside Lights – Unswitched Bedside Lights – Plug In Ultra Modern Wall Lights Modern Wall Lights with Fabric Shades Modern Wall Lights with Glass & Plastic Shades Plaster Wall Lights Corner Wall Lights Mood Lighting incl LED Contemporary Wall Lights that Wall Wash Sculptural Wall Lights Fun & Funky Wall Lights Niche Lighting Traditional Wall Lights Wall Sconces & Flush Fitted Wall Lights Art Deco 40s & Post War Ironwork Wall Lights Ornate Wall Lights & Crystal Picture Lights Wall Uplights Vintage and Industrial Wall Lights Stair and Low Level Lights Wall Mounted Spotlights Ceramic Wall Lights Double Height Atriums Illuminated Shelves Nursery Wall Lights Switched Wall Lights Designer Wall Lights ENERGY SAVING DOUBLE INSULATED – Recessed Lighting – Downlights Adjustable Mains Downlights Decorative Ceiling Recessed Downlights Emergency Recessed Downlights Fixed Low Voltage Halogen Downlights Fixed Mains Downlights Multiple Downlights – Twin, Triple & Quad Oversize Downlights – Cover holes left by R50, R63, R80 Downlights Recessed Scoop Lights Semi Recessed Downlights and Pull Out Spotlights Traditional Style Recessed Downlights Trimless Recessed Lighting Fixed LED Downlights Adjustable LED Downlights Fire Rated Downlights Adjustable Low Voltage Halogen Downlights Downlights For Reflector Lamps – Bathroom Lighting Recessed Bathroom Downlights Bathroom Ceiling Lights Bathroom Mirrors with Integral Lighting Bathroom Mood Lighting Bathroom Shaver Lights Bathroom Wall Lights Bathroom Niche Lighting Budget Bathroom Lighting Decorative Bathroom Lights Illuminated Bathroom Cabinets Illuminated Glass Shelves Illuminated Shaving Mirrors Light Bars & Spotlights Bathroom Lighting with Pullcords Or Switches Lights for Use Around a Bathroom Mirror Single Wall or Ceiling Spots For Bathrooms Bathroom Lighting Accessories DOUBLE INSULATED Zone 1 Bathroom Lighting Zone 2 Bathroom IP44 ENERGY SAVING – Kitchen Lighting – Recessed Kitchen Lighting 12v Downlights: Fixed 12v Downlights: Tilt Downlights: LED Lamps Oversize Downlights Mains Downlights: Fixed Mains Downlights: Tilt Recessed Scoop Lights Multiple Downlights Fire Rated Downlights Kitchen Breakfast Bar Lights – Track Lighting for Kitchens 12v Tension Wire Systems Aesthetically Designed Track Kitchen Track Packs Stylish Slim 12v Track – Silver Grey Black and Chrome Mains Track Contemporary Mains Track in Silver Grey Ceiling Mounted 3 Circuit Track Lighting Under Cabinet Lighting Kitchen Plinth Lighting Kitchen Spotlight Bars Illuminated Kitchen Shelves Kitchen Fluorescent and LED Lights Over Cabinet Lighting Kitchen Touch Sensors and Dimmers Flyover Lighting – Track Lighting Ceiling Mounted Single Circuit Track Lighting Low Voltage Tension Wire Track Lights Elegant Mains Lighting Track – Black & Chrome Elegant Mains Lighting Track – White Elegant Mains Lighting Track – Silver Grey Basic Mains Track Aesthetically Designed Mains Track Ceiling Track For Recessed Installations Track for Suspending Pendants Ready To Install Track Packs Ceiling Mounted 3 Circuit Track Lighting – Integrated Lighting Low Level Wash Lights – Plaster-In Downlights Trimless Downlights – Easy install Trimless Downlights – Skim Coat Required Plaster-In Decorative – Seamless Linear Lighting Systems Lighting Equipment for Blade range Mini Blade Channel Lighting System Micro Blade Channel Lighting System Cornice and Cove Lighting LED Wall Washing – Outdoor Lighting Modern Exterior Lanterns Flush Mounted Modern Exterior Lanterns Bracket Mounted Ext. Wall Lights inc Bulkheads Architectural – Up & Down Wall Lights – Downlights Coastal Lighting – Corrosion Resistant – Traditional Garden Lighting Traditional Bracket Mounted Lanterns Traditional Flush Mounted Exterior Lights Traditional Post Lights Traditional Lamp Posts Architectural Floodlights Buried Exterior Uplights Bollard Lighting Spike Lights Exterior Wall Adjustable Spotlights Decorative & Party Lights Decking & Ground Lights Brick & Low Level Lights Hanging Porch Lights Garden Floodlights Drive Over Lighting Illuminated House Numbers Soffit & Eaves Lighting Exterior Wall Lights with PIR Sensors LED Lights Exterior Designer Outdoor Lighting Lamp Post Lighting Exterior Post Lights Outdoor Lighting Accessories PIR & Home Automation DOUBLE INSULATED – GARDEN Outdoor Ceiling Lights – Commercial Lighting – Architectural Exterior Adjustable Exterior Projectors Architectural Exterior Floodlights Bollard Lighting Ceiling Mounted Exterior Downlights Exterior Colour Change Lighting Exterior Commercial Wall Lights Exterior Ground Recessed Lights Lamp Posts and Street Lighting Recessed Wall Luminaires & Guide Lights Wall Luminaires With Directed Light – Architectural Interior Big Scuptural Wall Lights Making an Entrance – Centrepiece Lights High Output Wall Lights – Restaurants & Bars Feature Pendants Multiple Pendants Single Pendants Mood and Display Lighting inc. 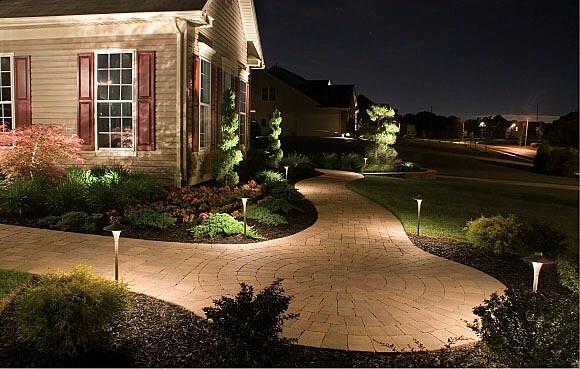 If you have a curved or sweeping drive, or if you regularly have to reverse in or out of your drive, you may wish to mark the edge of the drive with buried lighting either in the drive or in the lawn. This lets you and your guests see the driveway and avoid driving on lawn areas. CeilingLightingCeiling Pendant LightsClustered Light Pendants – MultiplesSuspended Ceiling LightsSpotlights & SpotbarsChandelier Style LightingFlush & Semi Flush Light FittingsInterior Hanging LanternsDining Room Ceiling LightsHand Built Artisan LightingLED Ceiling LightsCornice LED Lighting SystemsFun & Funky Ceiling LightsRise & Fall PendantsShades (Non Electric)Ceiling Lighting – KidsCeiling Lights That Save EnergyDesigner Ceiling LightingDouble Insulated WallLightsBedside & Reading LightsUltra Modern Wall LightsModern Wall Lights with Fabric ShadesModern Wall Lights with Glass & Plastic ShadesPlaster Wall LightsCorner Wall LightsMood Lighting incl LEDContemporary Wall Lights that Wall WashSculptural Wall LightsFun & Funky Wall LightsNiche LightingTraditional Wall LightsWall Sconces & Flush Fitted Wall LightsArt Deco 40s & Post WarIronwork Wall LightsOrnate Wall Lights & CrystalPicture LightsWall UplightsVintage and Industrial Wall LightsStair and Low Level LightsWall Mounted SpotlightsCeramic Wall LightsDouble Height AtriumsIlluminated ShelvesNursery Wall LightsSwitched Wall LightsDesigner Wall LightsENERGY SAVINGDOUBLE INSULATED RecessedLightingAdjustable Mains DownlightsDecorative Ceiling Recessed DownlightsEmergency Recessed DownlightsFixed Low Voltage Halogen DownlightsFixed Mains DownlightsMultiple Downlights – Twin, Triple & QuadOversize Downlights – Cover holes left by R50, R63, R80 DownlightsRecessed Scoop LightsSemi Recessed Downlights and Pull Out SpotlightsTraditional Style Recessed DownlightsTrimless Recessed LightingFixed LED DownlightsAdjustable LED DownlightsFire Rated DownlightsAdjustable Low Voltage Halogen DownlightsDownlights For Reflector Lamps BathroomLightingRecessed Bathroom DownlightsBathroom Ceiling LightsBathroom Mirrors with Integral LightingBathroom Mood LightingBathroom Shaver LightsBathroom Wall LightsBathroom Niche LightingBudget Bathroom LightingDecorative Bathroom LightsIlluminated Bathroom CabinetsIlluminated Glass ShelvesIlluminated Shaving MirrorsLight Bars & SpotlightsBathroom Lighting with Pullcords Or SwitchesLights for Use Around a Bathroom MirrorSingle Wall or Ceiling Spots For BathroomsBathroom Lighting AccessoriesDOUBLE INSULATEDZone 1 Bathroom LightingZone 2 Bathroom IP44ENERGY SAVING KitchenLightingRecessed Kitchen LightingKitchen Breakfast Bar LightsTrack Lighting for KitchensUnder Cabinet LightingKitchen Plinth LightingKitchen Spotlight BarsIlluminated Kitchen ShelvesKitchen Fluorescent and LED LightsOver Cabinet LightingKitchen Touch Sensors and DimmersFlyover Lighting TrackLightingCeiling Mounted Single Circuit Track LightingLow Voltage Tension Wire Track LightsElegant Mains Lighting Track – Black & ChromeElegant Mains Lighting Track – WhiteElegant Mains Lighting Track – Silver GreyBasic Mains TrackAesthetically Designed Mains TrackCeiling Track For Recessed InstallationsTrack for Suspending PendantsReady To Install Track PacksCeiling Mounted 3 Circuit Track Lighting IntegratedLightingLow Level Wash LightsPlaster-In DownlightsPlaster-In Decorative Seamless Linear Lighting SystemsCornice and Cove LightingLED Wall Washing OutdoorLightingModern Exterior Lanterns Flush MountedModern Exterior Lanterns Bracket MountedExt. If your garden does not have high levels of ambient light from street lamps or your own general lighting you may wish to highlight the path to avoid inadvertently treading in flowerbeds or borders. This lighting can be very valuable not only to ease navigation but also provides a some life to dark areas at night. 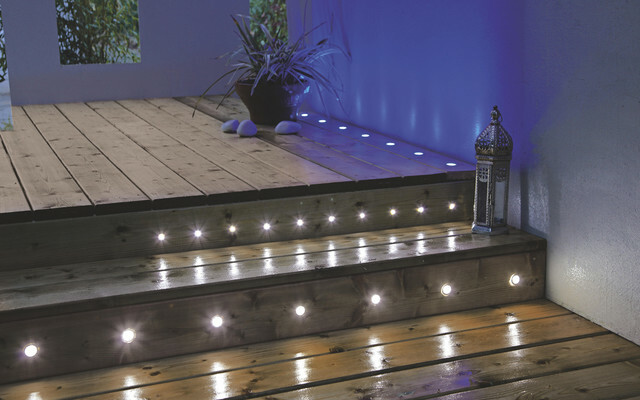 Used to illuminate paths, drives or timber decking these lights and are called demarcation lights. 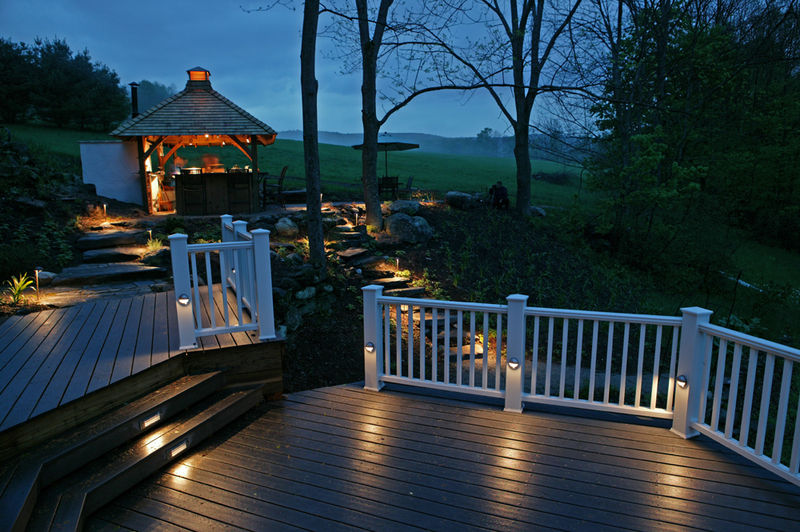 Deck and ground lights allow you to determine where one area ends and another begins. Available in various sizes and finishes to suit your needs. Scroll to the bottom of this page for advice and information on demarcation lighting. If you require further information call our sales team on 01780 767617. Enter your model number to make sure this fits. ✔ Pack of 1 Solar Ground Light. ✔ This Solar Ground Light requires no wiring as it charges through the daytime purely from the sun’s rays and even receives charge on an overcast day. 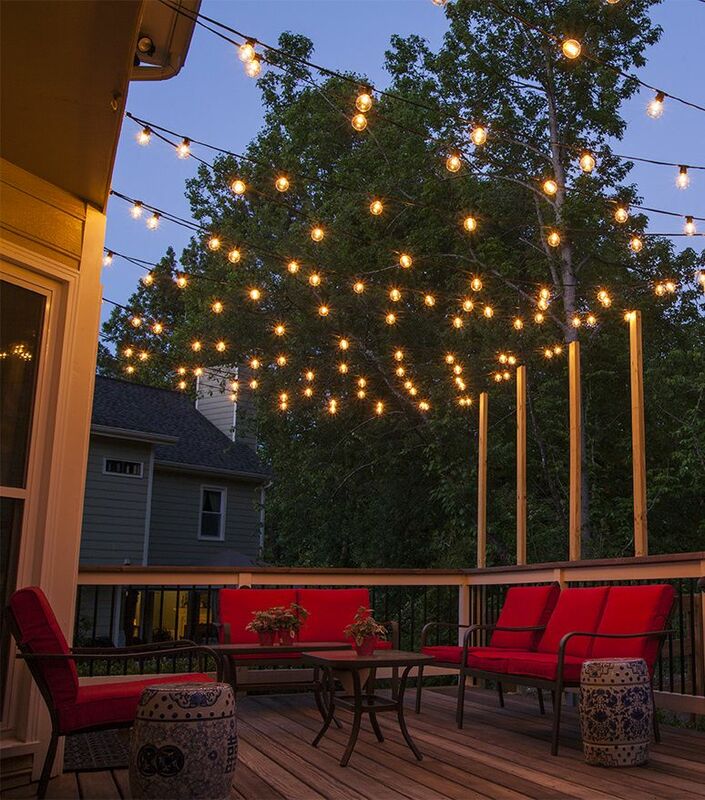 ✔ The light switches on automatically at dusk to deliver a gentle, glowing light. ✔ Product dimensions: 8.5cm x 8.5cm x 8cm. ✔ Waterproof, Rechargeable battery included – Ready to use out of the box, One LED per fixture, Bulb: LED, Base Hole Diameter: 61mm (diameter of the base that fits in to the deck), Depth: 3. On jetties low level, glare free lighting is imperative to negotiate around hazards that would cause injury or endanger life. Marine use require fittings with resistance to corrosion and high ingress protection. 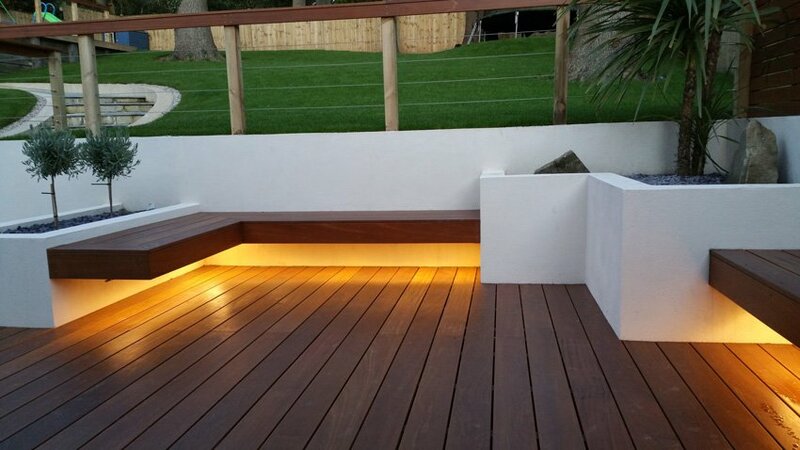 Demarcation lighting is used around paths, drives, jetties and timber decked areas to highlight where one area finishes and another begins. Perfect for lighting decks, flower beds, patio’s, paths etc. Charge during the day and light at night. Gives a gentle warm white glowing light. Auto on/off – Automatically turns on at dusk. 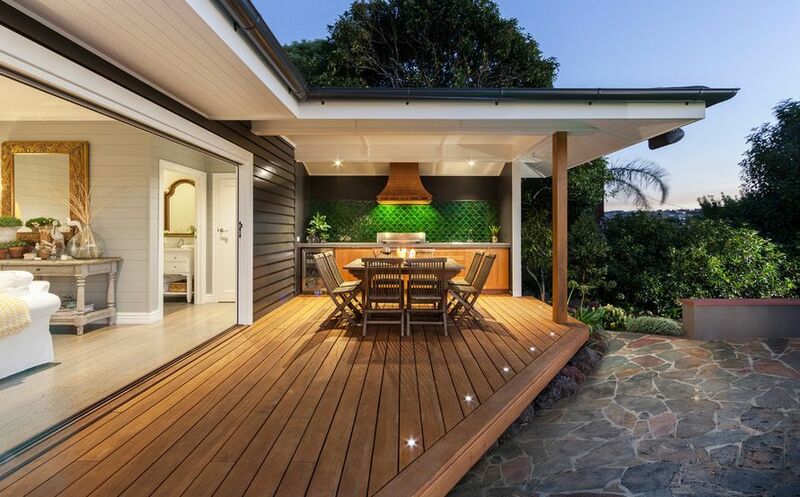 On a timber deck you do not want guests to trip or fall and a low level light provides assistance to avoid tripping as well as providing soft and subdued lighting that gives a pleasant effect. Colours that work well include white light, amber or yellow and red. In some locations blue LEDs do look effective but beware as blue light can seem more intense to the eyes at night. 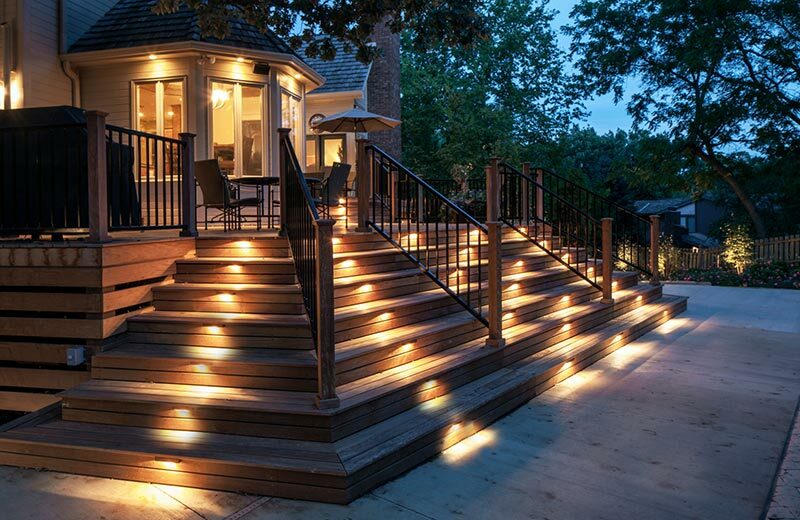 Wherever possible avoid creating glare particularly near the edge of decking or around stairs and steps. 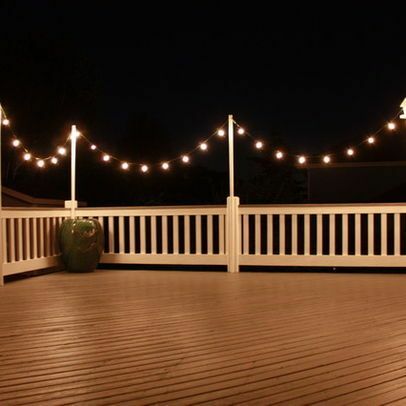 If there is not much ambient light in your garden and you position a buried uplight shining straight up near or on a pedestrians route you will cause glare. The intensity of the buried uplight can be 500x brighter than moonlight or low ambient lighting. In bright light the eyes iris contracts to restrict the light entering the eye and in the above scenario may find yourself or your guests disabled by the bright light which can result in loss of balance at worst or discomfort at best. The solar ground light requires no wiring as it charges through the daytime purely from the sun’s rays and even receives charge on an overcast day. The light switches on automatically at dusk to deliver a gentle, glowing light. 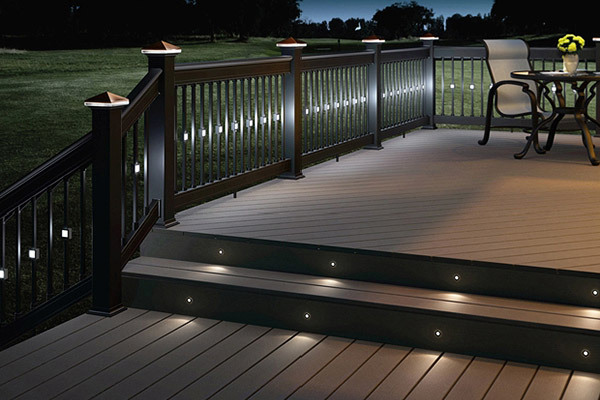 Ideal for decking, flowerbeds, patios and driveways. 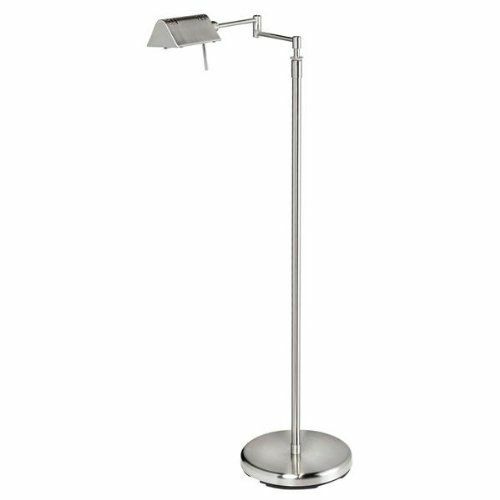 Product dimensions: H 8.5cm x L 8.5cm D 8cm.